New York City's Police Department is looking to cut back crime by informing iPhone-owning residents that they should update their devices to the latest version of iOS in order to obtain new security features designed to thwart potential thieves. 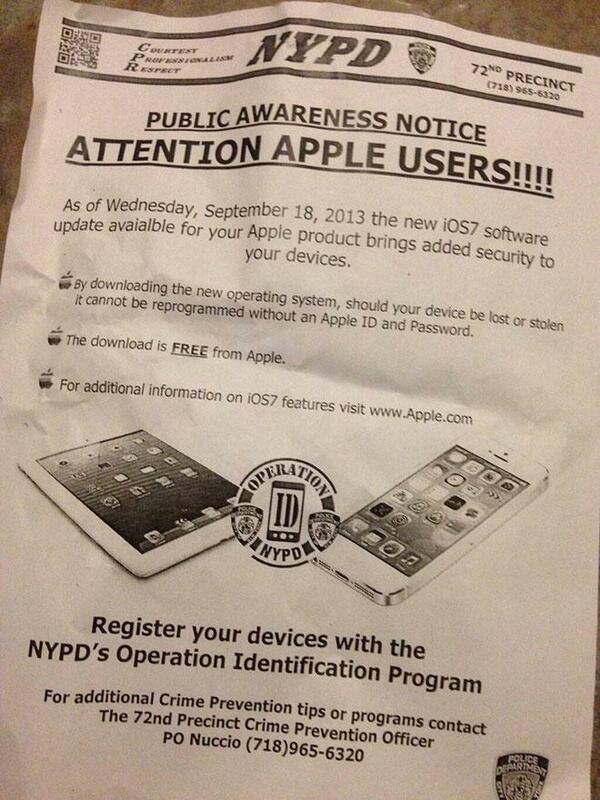 The weekend brought reports that NYPD officers were handing out informational flyers to passersby, urging them to upgrade to iOS 7 in order to take advantage of the security features Apple has built into its latest operating system. Twitter user Michael Hoffman published a picture of one of the flyers on Sunday. Specifically, police hope that iPhone owners will upgrade, which will automatically install Apple's Activation Lock feature. That security feature keeps a thief from erasing a phone's data and reactivating it. Instead, the original Apple ID and password used to activate a device are needed to perform such actions or to deactivate Find My iPhone. Apple first showed off Activation Lock at this year's Worldwide Developer Conference. The feature is an integral aspect of iOS 7's security suite, and it is is active on any device with iOS 7 installed. New York in particular has had a considerable problem with the theft of iPhones and other Apple products. Between January 1 and September 23 of last year, the city saw a 11,447 recorded thefts of Apple products. Apple product theft accounted for 14.4 percent of major crimes, and the rise from 2011 to 2012 in iDevice thefts outpaced all other crimes over the same period. Government officials from both New York and San Francisco repeatedly called on Apple and other device makers to build better security features into their smartphones and tablets. The Activation Lock feature in iOS 7 has been met with cautious optimism, though officials note it is not a complete solution, but instead a step in the right direction.